Television director Eric Dean Seaton has pushed all of his chips to the center of the table with his Legend of the Mantamaji graphic novel. 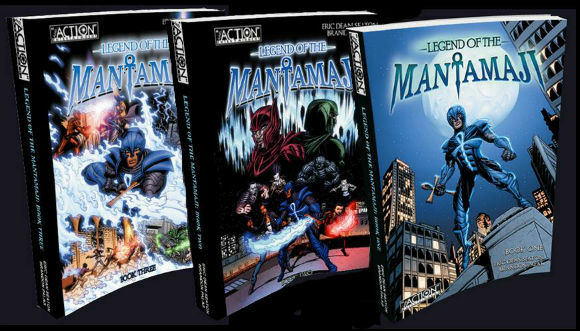 Television director Eric Dean Seaton has pushed all of his chips to the center of the table with his Legend of the Mantamaji graphic novel. The Shadow League first spoke with Seaton regarding his new work way back in 2014 when we invited him down to our Madison Avenue offices for a lively, on-camera conversation about what fans could expect. That was prior to the release of the first book. Since that time Legend of the Mantamaji has gained a cult following across the country. Last month, TSL Comic Book Convo surveyed the entirety of the Jacob Javits Center in search of sisters and brothers peddling their illustrated wares at New York Comic Con. We ran into Seaton as a swarm of fans accosted his both to see the new live action short based on the first action scene from the graphic novel and it was easy to see that his books popularity had increased by leaps and bounds over the previous year. First, second and third issues of the book were arranged side-by-side on Seatons display table and it was clear that many who bought the book were already fans as Eric Dean Seaton completely ran out of all copies of his second issue. Watch as Eric and I discuss Legend of the Mantamaji, the state of indie comic creators today and much more.